We continue to receive exceptional industry recognition for our engineering team’s innovative work with NAND flash. 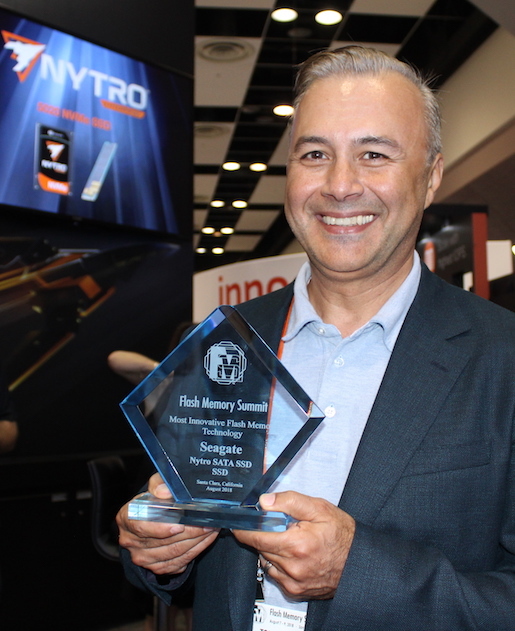 The new Seagate Nytro 1000 SATA SSD series (which includes Nytro 1351 and Nytro 1551 SSDs) with DuraWrite technology was awarded “Best of Show” as the Most Innovative Flash Memory Technology at Flash Memory Summit (FMS) 2018. The award serves to showcase true advances in the way flash memory is used in products to improve overall performance and endurance. At Seagate, we’ve worked very hard to address a known NAND flash issue and reach this key milestone. Since NAND is very sensitive to the total amount of data written to it, more data has meant a shorter service life for the flash. With DuraWrite technology, we’ve been able to solve this problem by employing intelligent lossless compression techniques. 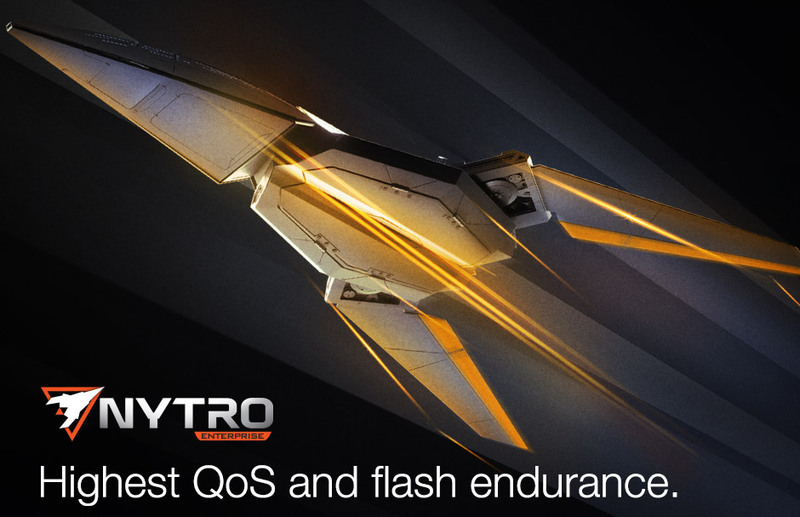 Furthermore, the Nytro 1000 series leverages the grade of data compressibility found in most enterprise, financial, or database applications faster than other enterprise SATA SSD solutions. 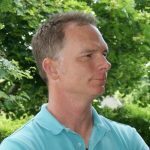 Even in applications where compression is used within the database to put emphasis on the economy of space, a 10-20 percent compression ratio is still possible due to the compressibility of metadata structure around compressed data. It seems that Seagate’s DuraWrite technology is now leading the way in helping to increase the endurance and performance of NAND flash. And with the latest Nytro 1000 SATA SSDs also set to be deployed by data center managers, the cost-effectiveness of this overall solution couldn’t be more apparent or timely. Seagate’s team at FMS said the award is another strong validation for the company’s technical leadership. “Innovation is one of our key values, and this reflects the continuing innovation within the engineering team that worked on this product line,” added Yev Koup, enterprise SSD product marketing manager. 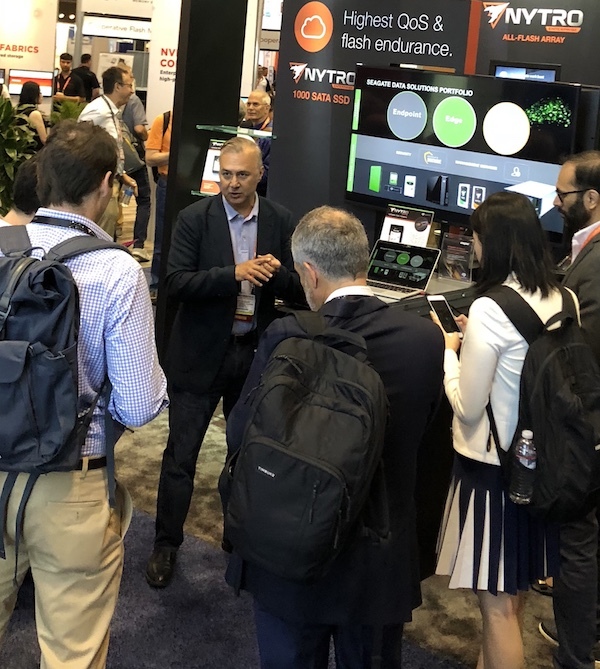 Along with the award-winning Nytro 1000 SATA SSDs, Seagate’s booth at FMS showcased several other flash technologies, including the new BarraCuda SSD, which offers a significant performance upgrade for laptops and PCs, and the company’s third-generation NVMe enterprise drive, the Nytro 5020. There also were a number of customer products utilizing Seagate’s flash-based storage on display. Among those products: an Intel NUC mini-PC for entertainment and gaming, which uses the 2TB BarraCuda SSD, and a high-capacity JBOF (just a bunch of flash) storage system from Facebook, which was packed with several of Seagate’s NVMe SSDs.